We started Cross Town Movers, Inc. in 1996. We quickly became one of Oregon's top office and commercial relocation specialists. Now, with branches in Eugene, Corvallis, Newport, Salem, Bend, Medford, Coos Bay and Boise, we are growing into the Northwest's largest and most trusted local office and residential mover. ​Cross Town Movers currently employs 45 full-time staff and owns 25 different-sized moving trucks and trailers, giving us the size and strength to accommodate moves of almost any size. In 2006-2007, we performed more than 2 ½ times the volume of local relocations (from our Eugene Branch) in Lane County as our nearest competitor. We're still the area's preferred mover. 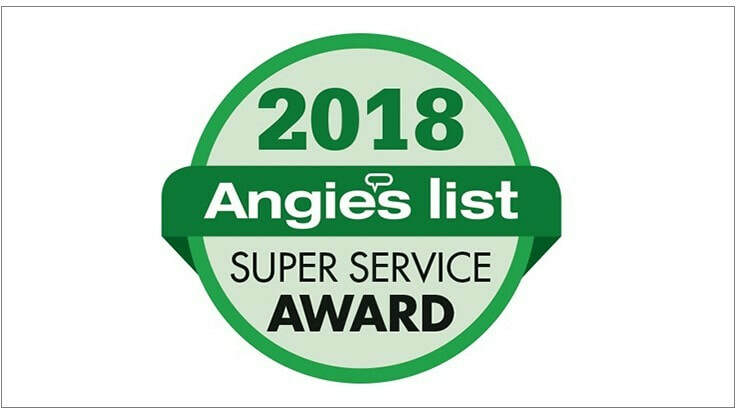 The reason that local business and government prefer our company is because of our commitment to the "Les Schwab Service Model". Our clean-cut, courteous staff provide a superior level of service and attention to detail when performing office relocations. 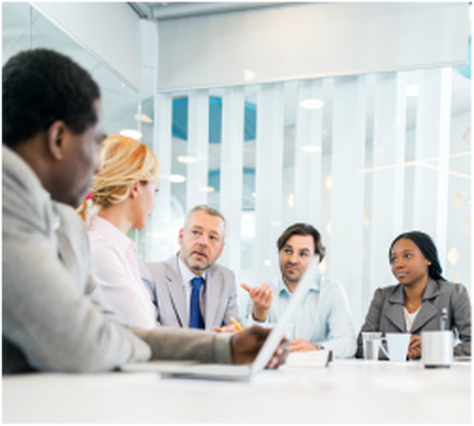 We are skilled and knowledgeable at efficiently performing large office relocations of 100 staff, or more, and we also accommodate small offices of just a few staff members. Our skilled office moving coordinator(s) will meet with your staff to formulate a plan for the efficient transfer, dis-assembly and re-assembly of your office space, while minimizing the interruption to your staff. We offer affordable relocation options for offices large or small and have state-of-the-art office moving equipment (including rolling office carts and library carts) to expedite the move. We typically provide boxes and colored labels, free of charge (please inquire)! We employ and retain top caliber office and residential relocation staff. Our full-time staff are highly trained office moving specialists, not college kids or temporary labor. Our staff's experience, teamwork and dedication to outstanding service will be evident, if chosen to perform your company's relocation. Preparation and planning are the keys to the success of any size office or commercial relocation. If awarded your company's relocation project, we will provide the planning (in conjunction with your move coordinator) needed that is critical to assure a smooth and timely relocation. Even though the relocation will be well planned out, we typically don't like to make it rigid. Flexibility is important! We will be ready and able to make quick changes as they are needed (or as you see fit). To better prepare your staff, we will provide a staff handout full of tips for preparation and also answers to frequently asked questions that your staff may have prior to the move. We typically provide time and materials estimates for relocating offices. This means that the actual man hours worked will be billed. Please inquire with your local office for standard applicable hourly rates. We typically provide boxes and labels free of charge (office moves only) as well as free box delivery and pickup. There is a charge for items such as tape or packing paper or odd sized boxes. After the move and box pickup, there will be a charge for materials not returned after the relocation. Time and materials bids for our customers cost less and allow us to perform higher quality work. If we were asked to bind your company's move, we would have to figure in every worst case scenario, driving up the final cost. If we run behind on our projections, the chance for less quality work inherently creeps in. Rest assured that we do not bill for breaks or for lunches. Also, most importantly, we feel that the experience level, synergy and focus of our staff will minimize the total hours worked significantly vs. a lesser experienced and temporary moving staff. Our company is well aware of turbulent economic times. Many local business are trimming spending, making layoffs and contemplating rearranging their space or moving to a smaller one. We can help! The efficiency of our service and staff will help to minimize the interruption to your business and can even help soften the blow for employees. While we excel at performing large scale, full-service office relocations, no longer are small in-house moving projects out of budget. Whether it is one file cabinet, a desk or a room full of office furniture, we can perform moves of all sizes and at affordable hourly rates. You simply let us know what you want moved and where you want it placed. Unlike our competitors who require a formal written estimate, days of advance notice and a four hour minimum, we only bill a one hour minimum and can normally accommodate same to next day service. We are also able to accommodate weekend, after hours and holiday relocations and we never charge overtime. 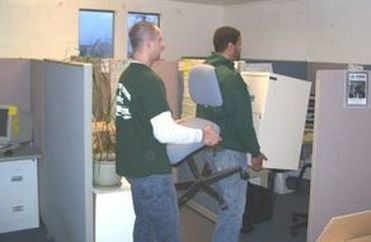 Our staff is trained to be conscientious of minimizing the interruption to your office during the move. Do you need to transfer office furniture or files across town to another location? We arrive in one of our clean, company moving trucks fully-equipped with our professional moving gear and staff who will expedite the transfer. Need extra room for office furniture or files? Our staff excels at organizing storage to maximize space. Often times our staff can even reorganize your current storage space to make more room! And, if you still need more storage space, we have options for that, too. If your company is thinking about upgrading your space, our company can help! We can relocate your goods to short-term storage, or simply move them out of the installer's way, inside the office, to save time and money. We have working relationships with several local flooring companies and are referred by them because of our timely arrivals and willingness to work around their schedule, on weekends, nights and holidays. Whatever the remodel project, we are skilled at minimizing the relocation burden. 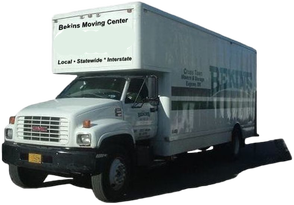 Cross Town Movers is proud to be Salem's exclusive agent for Bekins Van Lines. We offer professional relocation services for your staff, or office, to every city in the United States. For well over 100 years now, Bekins has been thriving nationally, with over 400 quality agents nationwide. Bekins leads the moving industry with programs like Guaranteed Price Protection and For All Its Worth Protection for your residential or office items in transit. Bekins drivers are skilled at providing safe, efficient and personalized customer service. Bekins Van Lines is recognized globally as an ISO certified carrier. This means that you can expect accurate times of arrival, constant communication and efficient claims handling. We extend to you our 100% guarantee that your company and staff will be satisfied with our services! Our staff arrive on time, in uniform and equipped with clean, state-of-the-art moving equipment to ensure safe and efficient transport. We constantly strive to improve and monitor quality of work from the top to the bottom within our organization. This will be evident to you due to our superior customer service and numerous relocation options. 1) Place a label on either side of the carton, NOT on the top. 2) Cartons are stacked when moved. Please do not over pack. Please use our smaller 1.5 cu. ft. book boxes for books, papers and miscellaneous. Remember, always use this smaller box when possible. Only use our larger 3.0 cubic-foot boxes for miscellaneous items that won't fit into the smaller boxes. 3) Never pack papers, files, or books in the larger boxes. Please use a minimum of two strips of tape on the bottom seam and 1 on the top. 4) Please use the labels and do not write directly on the box as your company may be returning the boxes for credit after the move. 1) Every item to be moved must have a label on it with a corresponding person's name and/or a department name as well as an applicable floor number, room number and piece number (please inquire with your Cross Town move coordinator for free labels and labeling recommendations). Depending upon the size of your company's relocation, we may or may not produce a formal map with assigned location numbers. Please inquire with your office move coordinator in regards to an applicable location number. 2) Computers, printers, wiring, telephones or any equipment which is fastened to desks, etc. must be disconnected. 1) Label the desk on the top surface. 2) Your desk will be placed on end to be moved. Please pack all desk contents. 3) Place small items such as pens, paper clips, rubber bands, etc. in an envelope and put it in one of your moving cartons. 4) Glass tops on desk - place a separate label on lower right hand corner. A) Remove all papers from under glass B) Remember, you still must label the desk. 1) Vertical (standard) file cabinets can be moved full. It is not necessary to pack contents. Be sure all pressure plates are moved forward. 2) Lateral File Cabinets - You may leave the bottom two drawers full. All drawers above the bottom two must be packed in cartons, unless they are traveling up or down stairs (in which case ALL drawers would need to be empty for the move). 3) Locks on file cabinets - if your file cabinet has a lock on it, to which you have the key, lock the file cabinet prior to moving. Be sure to store the key where it can be easily located after the move. If you do not have the key to the lock, please wrap packing tape around the lock until the lock can no longer be forced onto locking position. This prevents accidental locking during the move. 1) Contents are to be removed and packed into cartons. 2) If your bookshelves are held together by small metal or plastic pins or brackets, please remove the shelves and then remove all of the pins or brackets. Place them in a sealed envelope and pack them into one of your moving cartons. Don't forget to label each shelf with the same label as your bookcase. Large Supply Cabinets (and/or other) Cabinets. 1) Remove all contents and pack into cartons. 2) Label all cartons with the same label as the cabinet. 3) Do not tape doors closed. Computers, Keyboards, Printers, Fax Machines and all Electronic Components. 1) Unplug all equipment from the power source and from other peripheral equipment. 2) Place all cables, cords, covers etc. in a moving carton with your desk contents. 3) Make sure copiers and large printers have been properly serviced if applicable. We cannot move copiers or printers if they are leased. Please check with the leasing company for proper relocation procedures. We also cannot relocate printers that operate with liquid ink, only powdered ink. Place a label somewhere that it will stick, not on chair fabric. It is better to have a label on the chair base where it sticks than to have the label fall off. Personal items such as small photographs, personal plants, awards, placques, and other knick-knacks should be placed in a carton. Cross Town Movers cannot be responsible for these items if they are not packed properly. 1) It is not necessary to label carpet protectors (chair pads), or wastebaskets unless you are particularly fond of them and you require that your same unit be moved to your specific new location. 2) Labels are easily removed and will not leave any residue if removed immediately following move completion. 3) Move preparation is a great time to clean out your work area! If you haven't used certain items in a while, you probably never will. Don't move items which you no longer need.